The National Museum of Anthropology in Mexico City hosts one of the largest collections of archaeological artefacts and pre-Columbian masterpieces in the world. Among those, are a number of pieces, some extremely famous, others entirely neglected by tourists, that exhibit a level of technical sophistication far beyond the capabilities of the ancient peoples who supposedly realized them. This enormous monolith, weighting an estimated 24 tons, was discovered under the ruins of the Templo Mayor, the greatest temple of the Aztec capital city of Tenochtitlan. The enormous stone must have been dragged by thousands of peoples from quarries located at a distance of over 22 kilometers. It contains three rings or calendar wheels surrounding a central disk containing a depiction of the present Sun and of the four previous Eras or Suns, which ended in cataclysms. The first ring contains 20 glyphs corresponding to the days of the 18 months’ Aztec calendar. A second ring is similarly divided into squares, each containing 5 points, while the outermost ring contains the depiction of entwined fire serpents and more calendrical symbols. With its complicated symbolism and concentric rings or gears, the Aztec Calendar stone appears eerily similar to the petrified version of a mechanical device. The monolith of Coatlinchán is a colossal ancient statue that for centuries lay abandoned in an andesite quarry near the ancient city of Texcoco, before it was finally moved to Mexico City in 1964. The same andesite quarry is also believed to have provided much of the construction materials for the stone sculptures and megalithic architecture of Teotihuacan, some 25 miles to the North-East of Mexico City. It is believed that the monolith of Coatlinchán is a representation of the Rain-god Tlaloc. It is nearly 7 meters high and weighs an estimated 152 tons, making it the largest ancient statue and one of the largest carved monoliths in all the American continent. 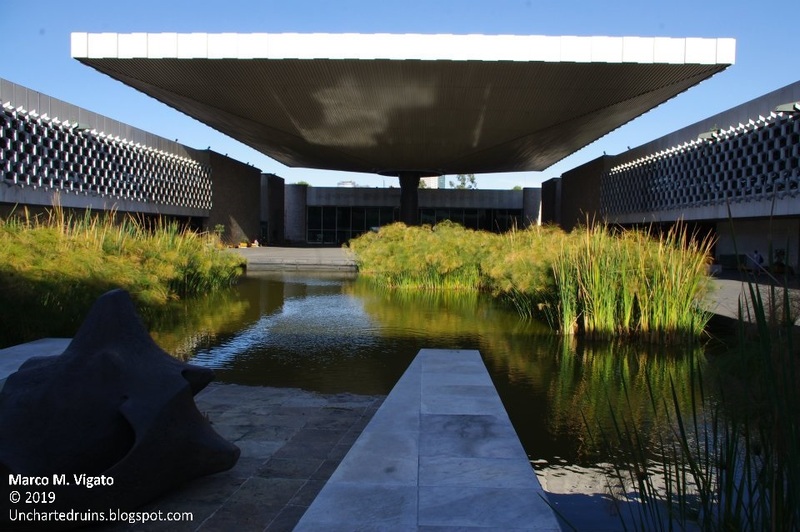 The monolith now decorates a fountain in front of the National Museum of Anthropology in downtown Mexico City. The Aztec room of the National Museum of Anthropology contains a number of colossal Aztec sculptures that once adorned the area of the Templo Mayor. Some of the most impressive ones include a giant crouching jaguar, depictions of the fire serpent or Tochancalqui, and some enormous serpent heads. The Coatlique statue is a particularly striking piece of sculpture depicting the ancient Aztec goddess of snakes, wearing a gown of entwined serpents and a necklace of severed human heads and hearts. From her decapitated head, two great serpents spring out. These statues, each weighting many tons, were carved from the hardest basalt and andesite stone by a people that had allegedly no knowledge of metal tools, and may be ranked among the finest and most striking pieces of sculpture anywhere on earth. This enormous statue popularly known as the ‘Goddess of Water’ was found at Teotihuacan, near the base of the Pyramid of the Moon. The huge andesite statue is over 3.2 meters (10 ft) tall and weighs an estimated 15 tons. It is stylistically similar to the great monolith of Coatlinchán and may have originally formed part of a pair of statues decorating a temple on top of the Pyramid of the Moon. Over 20 colossal Olmec stone heads are known, most of which from the Mexican states of Veracruz and Tabasco. The two examples that are found in Mexico City’s National Museum of Anthropology come from the ancient Olmec capital of San Lorenzo, Veracruz. Other than for their enormous size (each weighs between 8 and 12 tons), these sculptures are remarkable for their ornate headdresses and negroid features, with slanting, deep-set eyes and high cheek bones, suggesting they may depict individuals of a race different from that of the present inhabitants. A unique example of a drilled alabaster stone vase can be found in the Tula room. Discovered in Tula, Hidalgo, this unfinished vessel was carved with the aid of a tubular drill that left peculiar drill marks on the inside. There is no explanation as to how this was achieved by a people that supposedly ignored the use of metals but the material used (a very fine kind of alabaster) and the general workmanship are reminiscent of the finest early Dynastic Egyptian stone vessels. This small obsidian jar is perhaps one of the most exquisite objects in Mexico City’s National Museum of Anthropology. Made of a single piece of obsidian, it depicts a monkey holding its tail above its head as a kind of handle. It is not known by what means the hard obsidian (a type of black volcanic glass) was finished to achieve a perfect mirror polish without breaking it, nor how it was so precisely carved on the inside with walls just a few millimeters thick. The vessel was discovered in 1880 inside a tomb near the ancient city of Texcoco, but nearly nothing else is known of its provenance. Similar to the Monkey Vase of Texcoco, but on a smaller scale, these ear spools and pendants are also made of obsidian. They are carved to a perfect mirror-like polish, with walls so thin as to be almost transparent. Other examples are known from rock crystal and other extremely hard stones. It is a mystery how this level of workmanship was achieved without the aid of sophisticated metal tools by a people who allegedly ignored even the use of the lathe. The same level of mirror-like finish that is found on the smallest obsidian and jade objects can also be found on some larger basalt statues, like a number of magnificent coiled serpents. These works of art are not only striking for their extremely accurate workmanship, but also for their precise geometry that is almost suggestive of the use of machines or other unknown mechanical methods for cutting and shaping the stone. The mystery of the Codex Boturini lies not in how it was made, but rather in its contents. One of only a handful surviving Aztec codices, it contains a detailed account of the Aztec migration from a mythical place called Aztlan, depicted as a large island surrounded by water. From Aztlan, the Aztecs allegedly came to Mesoamerica, passing through a number of mythical and real historical places. The Codex Boturini has often been claimed to preserve the memory of the Aztec’s ancestral migration from Atlantis. The very name of Aztlan may be translated as the ‘place of whiteness’ or the ‘white island’. The equally legendary Chicomoztoc, the ‘Place of the Seven Caves’, from where the ancestors of the Aztecs emerged to repopulate the earth appears instead as a subsequent step in the Aztecs' migration after their departure from Aztlan. Just like Peru, with its countless legends of ancient tunnels and buried treasure, rumors of a vast ancient tunnel network that extends under much of Mexico and Central America are nearly as plentiful, many dating to a time earlier than that of the Spanish conquest. The Aztecs themselves believed that their ancestors had emerged from this mysterious underworld after a great cataclysm. In Aztec myths and legends, this underground world was known as Chicomoztoc, the “place of the seven caverns”. Maya creation stories also speak of the underground kingdom of Xibalba as a real, physical place, from which humanity had emerged at the dawn of time. Caves and ancient tunnels were believed to be the gates to this mysterious subterranean world. What follows is a list of the most famous ancient cave and tunnel entrances found throughout Mexico and Central America. The hill of Tezcotzingo, overlooking the ancient city of Texcoco, a short distance from Mexico City, contains the remains of several monolithic temples, rock-cut stairways and artificial aqueducts. It is believed that these remains date to the time of the king Nezahualcoyotl (1402-1472 AD), who built a magnificent palace on the hill. The unusual megalithic character and severe erosion of these structures may however point to an antiquity far more remote than the foundation of the city of Mexico by the Aztecs. Several cave entrances are visible on the hill of Tezcotzingo, all of which are presently blocked. When Bullock visited the ruins of Texcoco with the hill of Tezcotzingo in 1824, he could still admire the ruins of several pyramids and the great palace of the Kings of Texcoco on the hill, “of huge basaltic stones, carved and polished with the utmost exactness”. Bullock also described the whole mountain as “entirely perforated by artificial excavations”, in which immense riches were said to be buried, although for no amount of money his guides would accept to take him into the underground labyrinth. A tunnel entrance dug into one of the flanks of the hill leads through a steep descending passageway to an underground chamber. The entrance to another collapsed tunnel is visible below the floor of the chamber. It is rumored that this tunnel connects with another blocked passage exiting below a large monolithic basin known as the “Bath of the King”. A report of our 2016 expedition to Texcoco and Tezcotzingo can be found here. Inside Mexico City's Chapultepec Park lies a little-known monolithic temple that was at some point known as the “Tomb of the Aztecs”. It contains a number of badly-defaced bas-reliefs believed to depict the Aztec king Moctezuma, mysterious hieroglyphs and what are possibly astronomical figures of the stars, the Sun and the Moon. There are legends of a tunnel entrance in the same area where the hieroglyphic carvings and a giant rock-cut serpent sculpture are found. This cave, known as Cincalco, was said to be an entrance to the underworld. According to the Aztec “Legend of the Suns”, it was through this cave that the mythical Toltec king Huemac entered the underworld. Other traditions speak of the legendary tomb of the Aztec kings, hidden inside a maze of tunnels deep underneath the hill of Chapultepec in present-day Mexico City. The entrance to the cave was apparently sealed during the course of the 1990’s, and is presently blocked by a concrete slab. Many legends surround the so-called Cueva del Diablo or “Devil’s Cave” in Mexico City’s Cerro de la Estrella. The mountain, a prominent feature in the geography of the Valley of Mexico, was a sacred site since pre-Columbian times. Its name “Mountain of the Star”, suggests the hill may have served as a place of astronomical observations in antiquity. The remains of a large Aztec pyramid sit on its summit, where every 52 years a special ceremony was performed. During this celebration, known as the New Fire Ceremony, a giant fire was lighted to mark the beginning of a new calendar cycle. On the hill, among the many ancient petroglyphs and rock carvings, may be found the entrances to several caves. Of these, the Cueva del Diablo has a particularly sinister reputation due to mysterious disappearances and a number of reported attacks by what has been described as an “unknown creature”. The cave connects to a vast network of ancient lava tunnels whose true extent is presently unknown, but which are believed to run under much of present-day Mexico City. The ancient metropolis of Teotihuacan contains three massive pyramids and hundreds of structures. At its height, between the 2nd and 5th Century AD, it was home to an estimated population of 250,000, which would have made it the largest ancient city in the pre-Columbian world – the “Rome of America”. Yet, the identity of the city's original builders is still shrouded in mystery. A vast labyrinth of man-made tunnels and natural lava caves exists under the ancient metropolis, believed to extend for tens if not hundreds of miles. In 1880, the French archaeologist and explorer Desiré Charnay was among the first Europeans to penetrate the underground labyrinth of Teotihuacan. In his book “The ancient cities of the new world” he recalls having been led to what he described as the entrance to a cavernous quarry, some two and a half miles west of the pyramid of the Moon. There, several galleries branched off in different directions, leading to vast halls and chambers. Charnay also described an immense chamber with a dome-like ceiling, filled with human remains, which he considered to be the mausoleum of the mysterious race who built Teotihuacan and its great pyramids. Charnay speculated that the tunnels had originally been quarries, and were only at a later point converted into catacombs. Some of the tunnels that Charnay explored were remarkable for their straightness and perfection of construction, with one in particular said to run on a straight line to Amecameca, some 40 miles to the South-East. The entrance to the original tunnel system first entered by Charnay in the late 19th Century is presently lost, but more tunnel entrances can be found a short distance to the East of the pyramid of the Sun. In 2017 we explored a section of these tunnels, finding a system of interconnected chambers and blocked passageways that seem to extend for an unknown distance in the direction of the Pyramids of the Sun and the Moon. Reports also exist of vast tunnels under the Cerro Gordo mountain and in the nearby Tlapacique mountain range, where the openings of several air shafts or “respiraderos” point to the existence of yet more unexplored tunnels and chambers. In the 1950s, archaeologist René Millon speculated that the largest pyramids at Teotihuacan were built on top of vast underground cavities. He even found evidence of what he described as a “huge sealed pit” under the pyramid of the Sun, which he believed could lead to a tomb of immense proportions. Another tunnel was explored under the pyramid of the Sun in 1971, terminating in a clover-leaf chamber. This seems, however, to bear no relationship with Millon’s supposed tomb. In 2003, torrential rains revealed the entrance to another ancient tunnel under the Pyramid of the Feathered Serpent. Vast quantities of liquid mercury, mysterious pyrite spherules and over 50,000 buried artifacts were recovered from the excavation, yet no burial could be found. At present, the function of these tunnels is unknown, It is possible that they may have formed part of a secret representation of the Underworld extending for miles under the ancient city of Teotihuacan. A report of our latest explorations into the mysterious underworld of Teotihuacan can be found here. Find also a video from the 2017 expedition here. The ancient ruins of Xochicalco sit on top of an artificially terraced hill pierced by a number of ancient tunnels and mysterious passageways. There is evidence on the hill of earlier megalithic structures, including some enormous retaining walls built in the polygonal/ cyclopean style. The Pyramid of the Feathered Serpents, which dominates the Acropolis of Xochicalco, is also built of immense basalt stone blocks, decorated with sculptured panels that may allude to the destruction and later resurrection of the original “homeland of the Gods”. In another article we even suggest that the hieroglyphs of the pyramid of Xochicalco may in fact tell the history of Atlantis - Read the complete article here. The so-called “Cave of the Sun” is the only one of several tunnel entrances under the hill of Xochicalco that are presently open to the public. The main attraction of this tunnel system is a small, nearly circular chamber with an opening on top. On the day of the Spring and Autumn equinox, a ray of sun enters through the opening in the roof to light up the chamber. More blocked tunnel entrances can be found along the cliff face. In 1791, the learned scholar father Alzate y Ramirez was the first to report the existence of the tunnels or “subterraneans” of Xochicalco. One in particular he describesd as consisting of several “hallways” connected by winding stairways. The Indians accompanying the father on his expedition warned him that a person entering the underground labyrinth in the early hours of the morning would still not be able to find an end to it by sundown, or risk getting forever lost in the maze of tunnels and chambers. The ancient city of Mitla was the capital of a powerful Mixtec kingdom between the 9th and the 12th Century AD. A sacred city, it contained a number of palaces, pyramids and structures that are today found in varying states of preservation. Mitla is particularly famous for the elaborate stone mosaics that decorate its ancient buildings. Some immense megaliths, some of which weighing in excess of 45 tons, were employed in the construction of the ancient palaces, including a number of curious monolithic columns. Several tombs have been found under the main ceremonial structures of Mitla, the largest and most elaborate ones mimicking the architecture of the palaces above ground. The subterranean chambers are built of stone, finely cut and dressed, and frequently contain monolithic pillars and stone mosaics. The first European reports of the ruins of Mitla date to the early 16th Century. One such report by a father Torquemada describes an immense cavern by the name of Liyobaa, believed to be the entrance to the underworld and the seat of a powerful oracle of the dead that was famous throughout the land. This cave was entered though a set of three underground chambers located under the main palace of Mitla, which father Torquemada calls the “Palace of the Living and the Dead”. The cave itself was said to extend for more than 30 leagues underground, its roof supported by pillars. The Spanish priests sealed the entrance to the cave and built a church on the former site of the palace. Portions of the ancient building, including some immense monolithic lintels and columns, can still be appreciated under the small colonial parish church of Mitla. A comparison with the floor plan and orientation of the other surviving palaces of Mitla suggests that the entrance to the underground chambers and the cavern of Liyobaa would be found in the approximate location occupied by the altar of the present day Church. Other tunnels and cruciform tombs built of enormous megalithic stone blocks are found at Guiaroo and Xaagá. An ancient tunnel under the ruined hacienda of Xaagá is said to run all the way to Mitla, a distance of nearly 5 miles, its walls built of interlocking stone blocks like the underground tombs of Mitla. Read here a full report of our 2017 expedition to Mitla and Xaagá. In 1956, the excavations of an ancient mound in the outskirts of Morelia, in central Mexico, revealed a curious structure formed of giant blocks of stone apparently fused or melted together. What was at first believed to be a small volcanic outcrop, known to locals as “El Barreno”, turned out to be an ancient pyramid of unknown age. An opening close to the northern side of the pyramid revealed the entrance to an ancient tunnel with rock-cut steps. 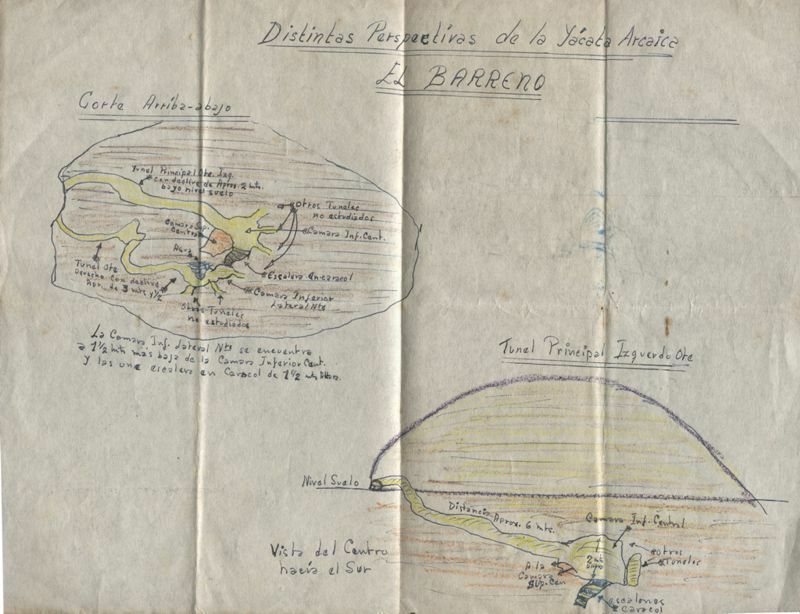 According to a map that was published by Dr. Jesús García Tapias shortly after his discovery of the tunnels, the main tunnel led to a large domed chamber from which at least 6 other passageways ran in different directions. After following some of the passages for a distance of over 500 meters, it was found that they were either blocked or flooded. Over the course of the last decade, the pyramid and its tunnels have been largely obliterated by the growth of the city of Morelia. It is however possible that future excavations in the area will again reveal one of the original entrances. Chalcatzingo is an ancient site of the Olmec civilization located in the Valley of Morelos, in Central Mexico. It dates to between the 7th and 5th Century B.C., with the ruins of a large ceremonial center which included at one time two pyramids, a ballcourt, various altars and sculptured monuments. Chalcatzingo is mostly famous for its rich rock-art, consisting of a number of carved bas-reliefs distributed along the slopes of the Cerro Chalcatzingo. One of the most famous carvings, known as “El Rey” (The King) depicts a man seated on a throne inside a cave. The mysterious figure is holding an object resembling a tablet or a scroll. Another scene illustrates a procession of torch-bearers, also seemingly taking place inside a cave, with more of the curious objects resembling tablets or scrolls. There is every hint that a sacred cave existed at Chalcatzingo, where sacred objects may have been stored. No such cave is known at the site, but a drone fly-over conducted in 2017 along the slopes of the Cerro Chalcatzingo revealed a few possible cave entrances. These are located high on the cliff-face, in a nearly inaccessible position. It is presently unknown what these caves may contain and how deep they reach inside the mountain. In this article we discuss the possible existence of an ancient and still undiscovered cavern at Chalcatzingo which may hold evidence of the visit of ancient "Gods". Tepoztlán is a small town located some 50 kilometers south of Mexico City. Here, amidst a setting of stunning natural beauty and unusual rock formations, the famous Peruvian explorer Daniel Ruzo believed he had discovered the remains of a “sacred forest” of giant rock sculptures similar to the ones he had himself discovered at Marcahuasi, in Peru, just a few years earlier. These sculptures, which Ruzo believed could be thousands if not tens of thousands of years old, formed a coherent sequence that in his mind described the full cycle of development of present humanity and of the races that preceded it. Ruzo also believed that some of the sculptures were in fact “portals” to a labyrinthine network of tunnels where the knowledge of the ancient races had been stored since time immemorial for the benefit of a future humanity. Many people perceive a strange energy or magnetism in Tepoztlán and its “Sacred Valley” is one of the places in the world with the highest frequency of UFO sightings and other unexplained phenomena. The Loltun cave in Yucatan is a large natural cavern containing extensive layers of human occupation that date back to the last ice age, some 10,000 years ago. It also contains a set of cave paintings attributed to the Maya civilization from the Pre-Classic period or even older. The true extent of this labyrinthine system of caves and passages is presently unknown, although nearly two kilometers of the entire cave systems have been mapped and explored. In 1931, the American archaeologist Robert Stacy-Judd recounted a strange episode in which, after getting lost in the cave, he was rescued by a mysterious man dressed like a Maya priest and carrying a torch. The explorer even managed to take a photograph of the mysterious “hermit”, which appeared in several newspapers at the time. There are rumors of secret passages inside the cave, and of a blocked rock-cut tunnel which is believed to lead into a deeper, unexplored section of the cave where great treasures are said to be buried. Within the Maya region of Yucatan, early explorers like Brasseur de Bourbourg, Stephens and Catherwood reported the existence of extensive ancient tunnels at both Aké and Izamal. These sites contain a number of pyramids and megalithic structures unlike any other in the Maya region, which may point to great antiquity. A sacred cave exists under the pyramid of Kinich Kakmo in Izamal, where a tunnel is said to connect this pyramid (the 3rd largest in Mesoamerica and one of the largest in the world, with a base of 195 by 173 meters and a height of 35 meters) with another that existed on the site now occupied by the great Franciscan convent of Izamal. Brasseur de Bourbourg explored and left a description of this tunnel in the early 1800’s, in which he mentioned a great subterranean chamber and more blocked passageways built of immense megalithic stones. Unfortunately, there seems to be no record of the existence of these tunnels in any of the more recent publications on the ruins of Izamal and Aké. Caves played a fundamental role in Maya cosmology as physical representations of the Underworld. At Oxkintok, Palenque, Toniná and Yaxchilan, mysterious labyrinthine passageways built underneath some of the main pyramids and palaces were meant to serve as symbolic caverns for initiation ceremonies related to the cult of death and of the ancestors. These Maya labyrinths contain underground corridors and chambers of unknown function. Over the course of initiation ceremonies, the candidate would be led in complete darkness through the confusing maze of passages and corridors, possibly under the influence of psychoactive drugs. Perhaps the best example of Maya labyrinths is found at Yaxchilan, along the Usumacinta river. The labyrinth extends on three separate levels and contains a number of blocked passages and chambers. At Oxkintok, a labyrinthine network of tunnels exists under one of the main pyramids, known as the Satunsat (meaning “Place where one gets lost”); while the labyrinth of Toniná, although of comparatively more limited extent, is perhaps the most monumental of all, with high corbelled ceilings that warranted it the name of “Palace of the Underworld”. For unknown reasons, these labyrinths were deliberately sealed or filled with rubble (as in the case of Toniná) during the 7th Century AD. It has been speculated that this occurred during a veritable “Underground revolution” during which the old gods of the Underworld were literally overthrown and their subterranean temples either sealed or destroyed. A lost Hall of Records at Yaxchilan? The ancient Maya labyrinth of Yaxchilan, with its labyrinthine corridors, sealed chambers and blocked passageways on at least three separate levels also appears to be a prime candidate for the location of the fabled Yucatan Hall of Records. First mentioned by the mystic Edgar Cayce in his readings, the Hall of Records is supposed to be a subterranean repository of ancient knowledge built in the days of Atlantis. This seems to be supported by local Tzeltal legends that speak of a subterranean “House of Darkness” built in the days of the mythical civilizing god and culture-hero Votan on the Usumacinta River to preserve the sacred records of his race. Teobert Maler was among the first archaeologist to conduct excavations at Yaxchilan in 1903. He was surprised to find several carved stalactites erected as stelae in front of some of the major buildings of the ancient Maya city, which led him to believe that the ruins may conceal the entrance to some immense underground caverns. It is very well possible that the lower and still unexplored levels of the Labyrinth may communicate with these caverns. Find out more about the Maya labyrinths of Yucatan and Chiapas and our quest for the Yaxchilan Hall of Records here (part I and part II). And also a video from our 2018 expedition into the mysterious labyrinth and tunnels of Yaxchilan. The ancient city of Copán, in present day Honduras, is one of the greatest marvels of Maya civilization. Its discovery dates to the early 1700’s, although reports of the city’s existence had been in circulation perhaps for nearly a century before then. 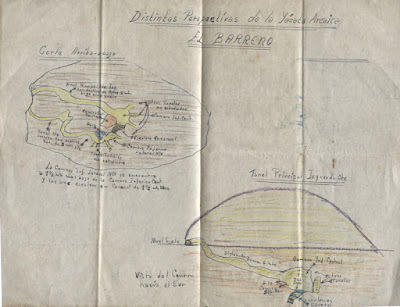 One of the most curious reports, published by Fuentes and quoted by several other antiquarians, including Galindo, Bancroft and Stephens, is that concerning the great cavern of Tibulca. This is usually described as a temple of great size, carved from the living rock in one side of the hill a short distance from the “Temple” and the “Great Circus” of Copan (no doubt referring to the main plaza of the ceremonial center, near the Acropolis). According to Fuentes, all these ruins still stood entire in his time around the year 1700. The underground temple of Tibulca in particular was said to be “adorned with columns, with bases, capitals and crowns”. A great number of windows, also hollowed out of the solid rock, illuminated the gloomy interior. No trace of this fabulous cavern of Tibulca could be found by later explorers, who additionally found many of the buildings first described by Fuentes in ruins, many having been washed away by the nearby river. Although a vast network of caverns was discovered in one of the hills near Copán during the 1800’s, no trace of the fabulous cavern of Tibulca nor of its underground temple has so far emerged. Palenque is perhaps one of the better known of the ancient Maya sites, visited every year by hundreds of thousands of tourists. Located deep in the forests of Chiapas, the ancient city lay abandoned for hundreds of year until its rediscovery by Europeans in 1773. Over the following decades, it was visited by various explorers, including John Lloyd Stephens and Frederick Catherwood, who left some of the earliest drawings and plans of the ruins. Palenque reached its greatest prosperity in the late classical period during the reign of the legendary king Pakal (611-683 AD), before falling into decadence and being eventually abandoned towards the midst of the 9th Century AD. The ancient name of the city, as known from inscriptions, was probably Lakam Ha, meaning "Plentiful Waters". The name appears to be a reference to the many water sources and streams that surround the ancient site. The Spanish called the ruins Palenque, from the name of the nearby village of Santo Domingo del Palenque that was founded in their vicinity in the late 17th Century. Although the earliest known king of Palenque, Kúk B'alam I, did not reign until 431 AD, the ruling dynasty of Palenque bolstered in inscriptions a divine origin dating back many thousands of years. The first divine ruler of Palenque known from inscriptions was the "God G1 the Elder" or Muwaan Mat, which was believed to have ascended to the throne in the year 3,309 BC (two centuries before the beginning of the present world age, in 3,114 BC, a date that also coincides with the beginning of the Maya calendar). A second divine dynasty began in 2,360 BC and comprised three more kings (known as the God G1 the Younger, God G2 and God G3). These divine kings were thought to have come from a mysterious land called Matwiil, symbolized by a cormorant. In honor of their ancestral homeland, the rulers of Palenque of the historical period still boasted in their titles that of "Divine Matwiil Lord" . Nothing of this prehistoric homeland is known, but it is possible that another enigmatic place name, Tokhtan (meaning "Mist Center), similarly occurring in hieroglyphic inscriptions, may as well be associated with it. A no less interesting story of the origins of Palenque was collected from the sacred books of the Tzeltal Maya in the late 17th Century by the then Bishop of Chiapas Francisco Nuñez de la Vega. Even before the city's rediscovery, the Tzeltal tradition spoke of a great lost city built by a foreign race, the Chanes (literally "Snakes"), under the guide of a mysterious prophet called Votan, a great hero and legislator who established a great empire of the Tzeltal people called Xibalba. According to the early Mayanist Abbé Brasseur de Bourbourg, this ancient empire once covered all of Mexico and Guatemala, and had Palenque as its capital (In the the Tzeltal legend, the city is called Nachan, "City of the Snakes"). Many have seen in these legends a variation of the familiar story of Quetzalcoatl and Kukulkan, as the hero was known to the Aztec and Yucatec Mayas. Votan, like Quetzalcoatl, was said to have come from a mysterious island kingdom, located beyond the sea, to the East, known as Valum Votan. The name of the Mexican colony of this great maritime empire was Valum Chivim. According to the original manuscript in the possession of Bishop Nuñez de la Vega, called the Probanza de Votan (the "Trial of Votan"), the kingdom of Nachan was one of four tributary monarchies of Valum Votan that together formed the empire of Xibalba or Valum Chivim. To the capitals of the other three kingdoms the same manuscript gives the names of Tulan (Tula? ), Mayapan and Chiquimala (near Copán). Various voyages are mentioned between Valum Votan and its colony of Valum Chivim, each under the guidance of a different Votan. During one of these voyages, a great temple was said to have been under construction on the island of Valum Votan, whose description is strongly reminiscent of the biblical Tower of Babel . Moreover, after his final voyage Votan was said to have built a "House of Darkness" on a certain river (probably the Huehuetan or the Usumacinta), where he deposited in subterranean chambers all the sacred records of its race, under charge of certain old men and priestesses . In a later article we will explore the possible connections between Votan and the esoteric legends of an ancient prehistoric "Hall of Records" in the Yucatan. Could Valum Votan be the same as the mysterious land of Matwiil, to which the kings of Palenque traced the beginning of their first divine dynasties? What proof is there of a prehistoric, non-Maya origin of Palenque? Clue may come from one of the largest structures in Palenque, the Palace, and from a vast underground network of aqueducts and tunnels that may predate the construction of the Classic Maya city. The Palace is an immense structure, rising on an artificial platform 300 feet (91 meters) long by 240 feet (73 meters) wide. The platform itself measures nearly 30 feet (10 meters) high, and is crossed by a number of galleries and vaulted corridors. The Palace grew over time to include a number of courtyards and an astronomical observatory in the form of a three-storied tower. Although most of the construction visible today dates to the Classic period, it is possible that earlier structures were incorporated in its foundations. These structures appear to be of the megalithic type, consisting of large, finely fitted and jointed blocks of stone, quite unlike the stuccoed masonry of small cemented stones, typical of Classic Maya architecture ,that forms the rest of the Palace structures. A wall consisting entirely of megalithic stone blocks, some of which measuring as much as 2 meters long, forms the first tier of the South side platform of the palace. These blocks appear to have suffered significant displacement due to natural forces that have altered the straightness of the joints and caused a deformation of the edges of the wall. This is particularly puzzling given the otherwise remarkable state of preservation of the Palace and may hint to this section of the Platform belonging to an earlier stage of construction. On the uppermost Palace platform, the lower walls delimiting Courtyard 1 are also entirely faced with large, smooth megalithic stone blocks comparable in workmanship and size to the ones in the bottom platform, and quite unlike any other of the surrounding structures. Many of the large flagstones in this area were apparently re-carved at a later time. A beautiful megalithic stairway, in a remarkable state of preservation, is also found in this area of the Palace. A short distance from the Palace, along its Western side, more evidence of megalithic stonework can be found in the underground aqueduct that runs parallel to its base from a mountain stream located a few hundred meters to the North. The underground aqueducts are one of the most unique characteristics of Palenque, not found at other Maya sites. The course of the river Otulum ("Fallen Stones") was deviated and channeled into an underground tunnel running for nearly 300 meters (1,000 feet) under the main plaza and portions of the Palace. This tunnel, a masterpiece of megalithic engineering, is built entirely of enormous flagstones, some of which measuring as much as 3 meters (9 feet) long, to withstand the water pressure. The peculiar architecture of the tunnel and corbelled vaulting is visible in several places where the roof has collapsed. In some cases these stone aqueducts run underneath structures dating to the early Classic period, an evidence of their great antiquity: In 2016, it was announced that a previously unknown water tunnel was discovered under the famous Temple of the Inscriptions that houses Pakal's tomb . The Temple of the Inscriptions is one of the earliest monumental structures in Palenque, dating to 683 AD, and contains within its structure the remains of earlier layers of construction. Because the newly discovered tunnels run under the Temple, their construction must predate that of the Temple itself. The absence of a connection between the tunnels and the chambers above also suggests that the existence of the tunnels may not have been known to the Maya builders. The megalithic tunnels and foundations of Palenque are evidence of a much older origin (perhaps even pre-Maya) of the site, a possibility consistent with the content of the hieroglyphic inscriptions found at Palenque, which include a long list of pre-dynastic rulers stretching back into prehistory, and with the local traditions of the Tzeltal people speaking of the arrival of a foreign race of megalithic builders from a land beyond the Sea. Perhaps the most interesting possibility hinted by these traditions is the existence of an ancient "Hall of Records" situated somewhere in the vicinity of Palenque, along the Mexico-Guatemala border. In a later article, we will speculate on the possible location of this "Hall of Records" and on the possibility that it may in fact have already been found at the ancient site of Yaxchilan on the Usumacinta river. Uncharted Ruins - Copyright 2012. Powered by Blogger.